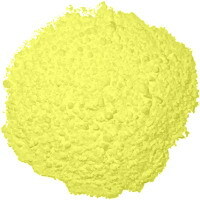 We are a leading Indian manufacturer of micronised Sulphur Powders. We started manufacturing of Sulphur powders in 1988 at Faridabad (Hry.). Today we have wide experience in handling of sulphur products and offer it's widest range in India - both for Industrial as well as agriculture use. For industrial uses we have several grades suitable for all kinds of indsutries and applications. We offer coated as well as un-coated powders, granules and liquid forms used in various applications for rubber, latex and other specialised products. The micronised powders are offered in various particle-sizes starting from Unistar-S1 (200 mesh) upto Unistar-S3 (325 mesh) for industrial uses. We can also offer higher fineness on request. Sulphur powders coated grades are also available for specialised applications. The coating material and methods vary according to the application. extra benefits in dispersion and dust free envoirnment.